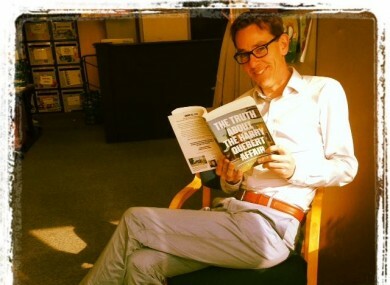 RYAN TUBRIDY IS putting his love of history into words, and is penning a children’s book. Tubridy told DailyEdge.ie that one of his projects this summer is to put a lot of groundwork into the project, which will be an historical-themed novel rather than an illustrated offering for younger readers. He’s secured a deal with an international publisher but the book is still in the early stages with no release date announced. Tubridy will no doubt have his two daughters Ella and Julia in mind when putting the chapters together. Ella, the eldest, has just completed her Junior Cert today with music as her final exam and her Dad shuddered and said he “felt like I was doing it myself”. Meanwhile the household has been up to ninety with girlfriend Aoibhinn Ní Shúilleabháin also working and studying hard on a PhD. The 2FM presenter said that Ní Shúilleabháin is “tremendous”. Tubridy will be taking a break from 2FM in July as he heads to BBC Radio 2 to sit in for Simon Mayo. Louise McSharry, who presents a show at 8pm on the station, will once again be filling in. She presents like she’s having a conversation with the listener. She’s really fantastic. Speaking at the launch of 2FM’s summer schedule at RTÉ today Tubridy said he’s also planning to take a two week holiday “with his girls” in Ireland later in the summer. The schedule launch presented an opportunity for station head Dan Healy to evaluate the changes made to the lineup three months ago, when a host of fresh talent was introduced to listeners. Speaking at the festival-style event in Donnybrook today Healy said that 2FM has been “running a marathon while undergoing open-heart surgery” and thanked listeners and the media for giving the changes a chance to take hold and find their footing. Eoghan McDermott, best known for his work on The Voice of Ireland, has been announced as the new weekend breakfast show presenter, which was the only major addition to the schedule. However Healy revealed a number of plans for the summer festival season, while also promising more live music, comedy and sports content. Email “Ryan Tubridy is writing a children's book this summer ”. Feedback on “Ryan Tubridy is writing a children's book this summer ”.